QUESTION: Mr. Armstrong; I want to thank you for defending the Ukrainian people in their quest to overthrow the government corruption. You are a great inspiration here in Kiev. What does your model show for the success of our revolution looking ahead? ANSWER: There are many in the West who know nothing of Ukraine and simply attribute the revolution to the CIA. I understand the disillusionment in Ukraine about these pretend analysts. They pontificate CIA and ignore that there was a real uprising of the people. Following the breakup of the Soviet Union, Ukraine endured years of corruption, mismanagement, lack of economic growth, currency devaluation, and problems in securing funding from public markets. The corruption became widespread and Yanukovich’s sons were engaged in a protection racket preventing people from going into small business. There is no other evidence of how the Ukrainian people have suffered under political corruption that has not really changed. Yanukovich was removed, but those under him are still in power and just changed their stripes. The CIA supported various politicians, but they were not capable of moving the people to rise up. 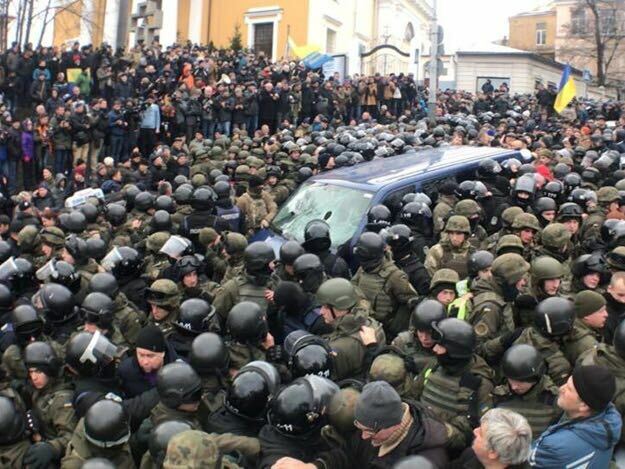 Recently, the current corrupt politicians did not realize that when the government tried to arrest Mikheil Saakashvili, the ex-Georgian leader-turned Ukrainian opposition politician, the people would rally and rescue him from the police wagon freeing him. The accusations that he plotted to overthrow the government is on par with the corruption. There were those in the USA who made similar accusations about WikiLeaks. I have a friend who lives close to where Saakashvili lived. He stood on the roof preaching to the people as the police tried to grab him. It was a real spectacle of corruption. They have also accused Saakashvili of accepting funding from an exiled Ukrainian businessman in a bid to seize power, which he denies. Thousands of people even gathered outside the courthouse after an almost-eight-hour hearing where the government tried to use the criminal process to eliminate an opposition leader. This is standard in politics and we see the Democrats in the USA trying the same tactics to Impeach Trump. The people are again demanding the impeachment of President Petro Poroshenko trying to stamp out corruption once again in Ukraine. The history of Ukraine has demonstrated a close correlation with a 52-year cycle aligning with the Economic Confidence Model of 51.6-years when it comes to political changes. This appears to be on schedule for a rise in tensions again here in 2018, but the peak is most likely coming into play in 2022.